The Last Leaf Gardener: Let them eat unshelled peanuts. 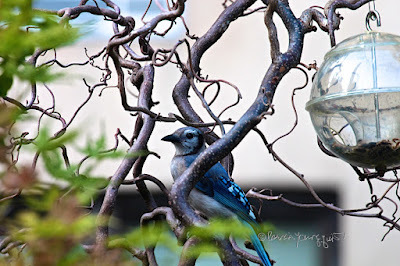 The photographs atop this entry features a blue jay alighting on the twisting branches of one of the shrubs growing in my urban garden which is a Avellana corylus (Contorted Hazelnut). 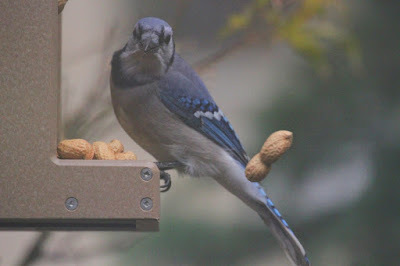 In the image he/she is eyeing a ball-style bird feeder that is nearly empty of the black-oil sunflower seeds which it holds. 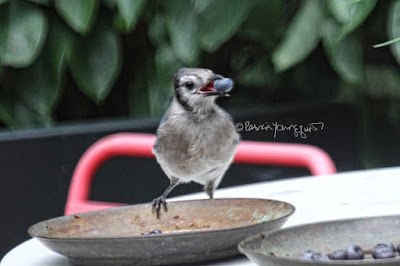 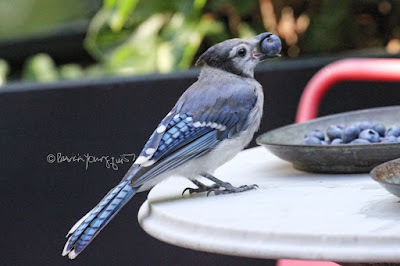 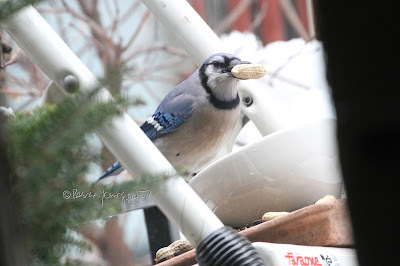 Blue Jays are known to eat these seeds as evidenced in the photo below, where a blue jay is availing him/herself of black-oil sunflowers seeds which I had placed on a a saucer. 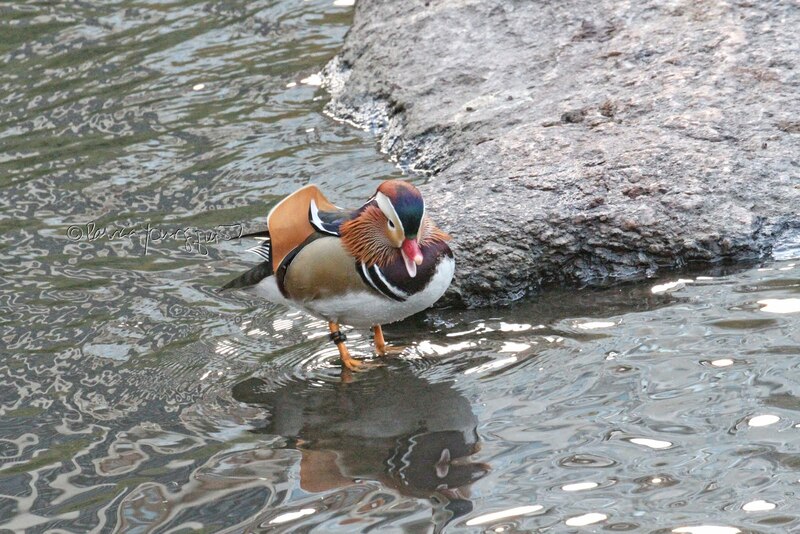 This bird-type also enjoys eating berries, especially blueberries, as evidenced by the next set of images. 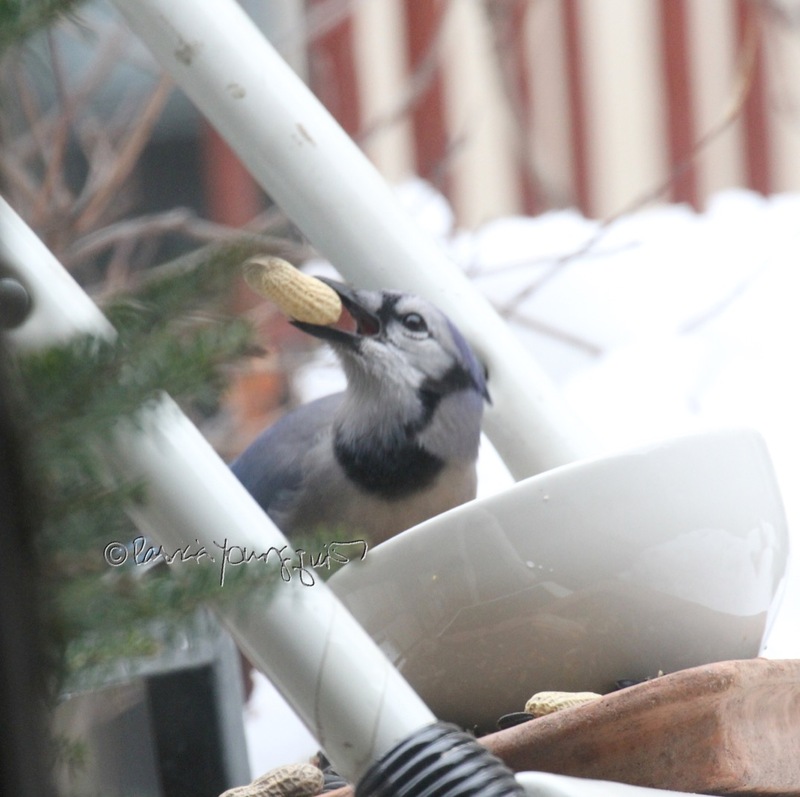 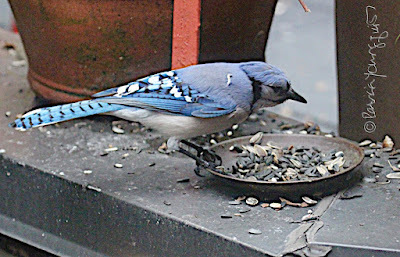 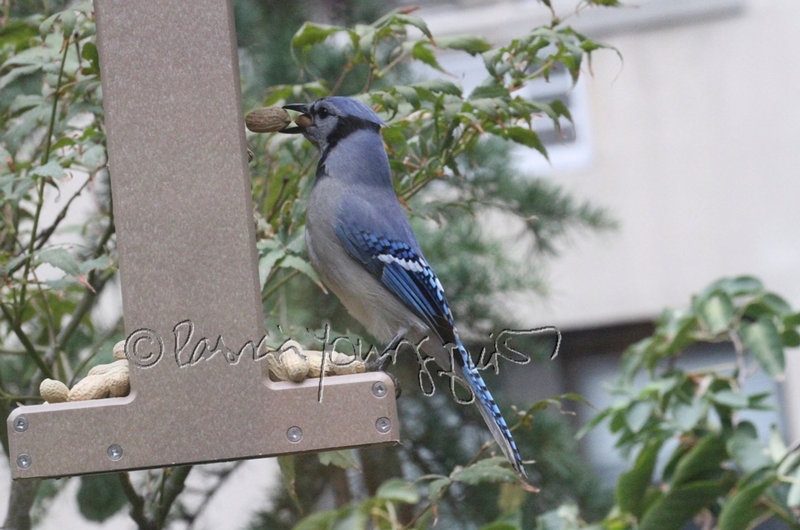 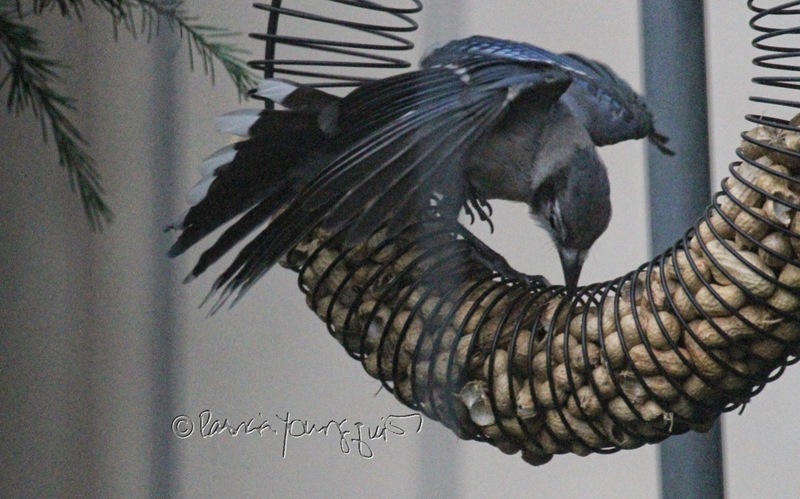 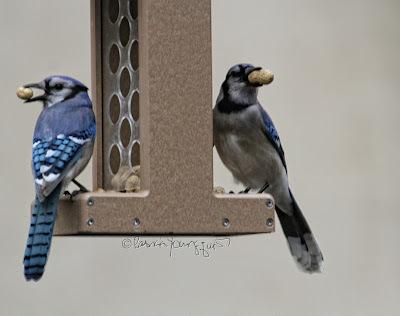 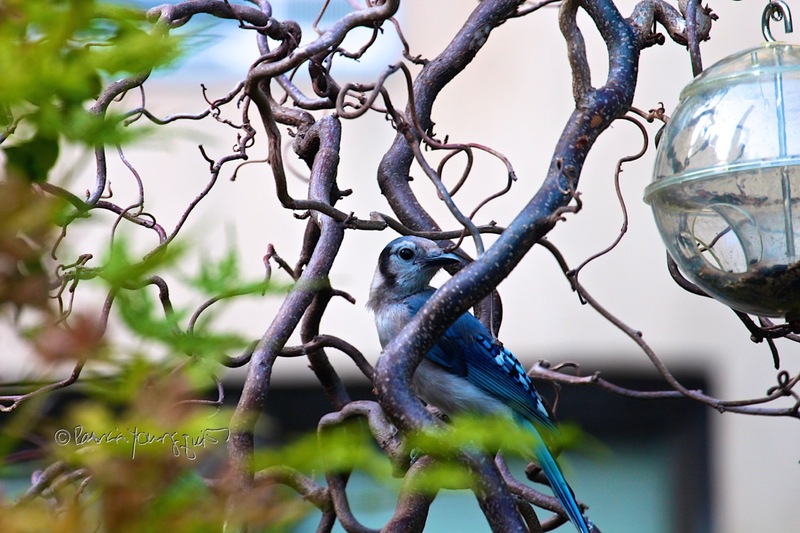 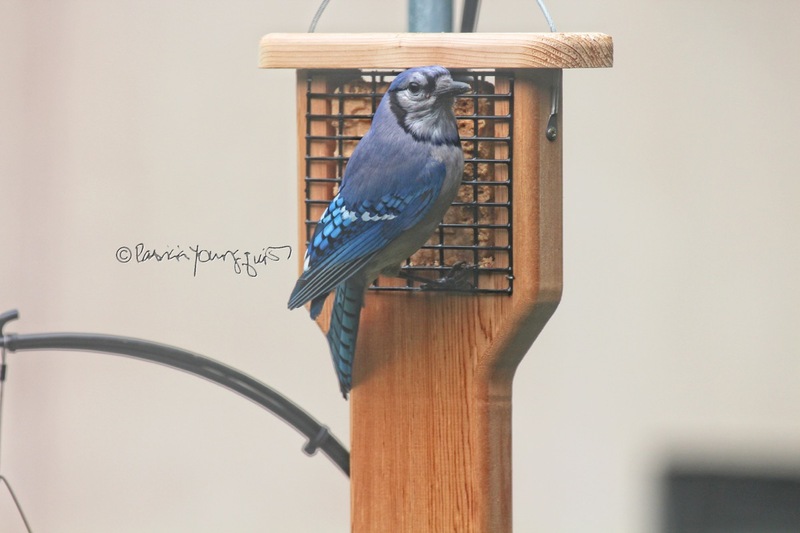 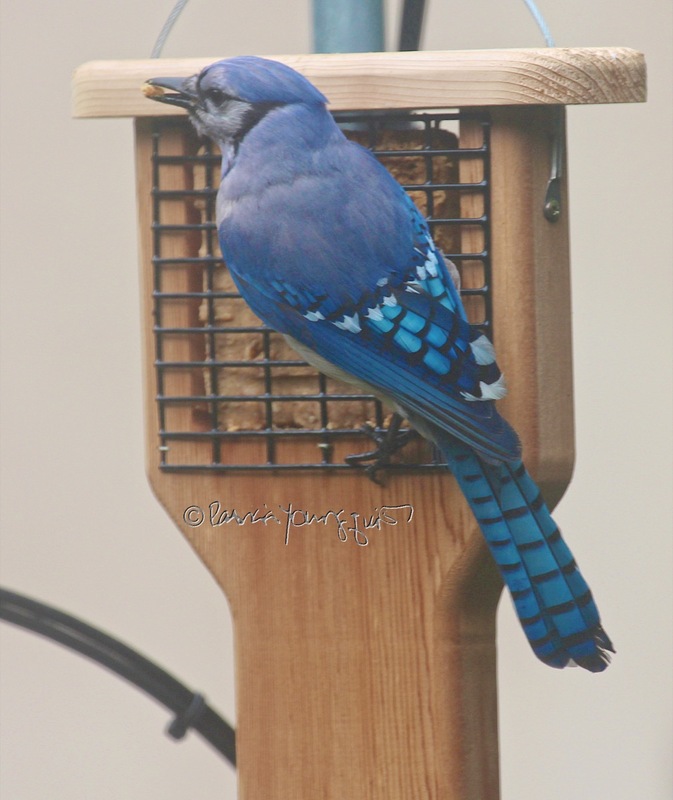 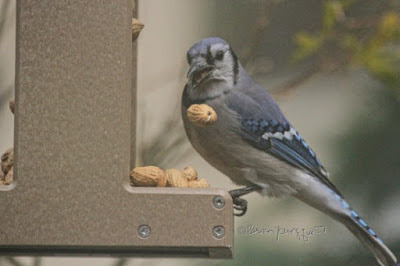 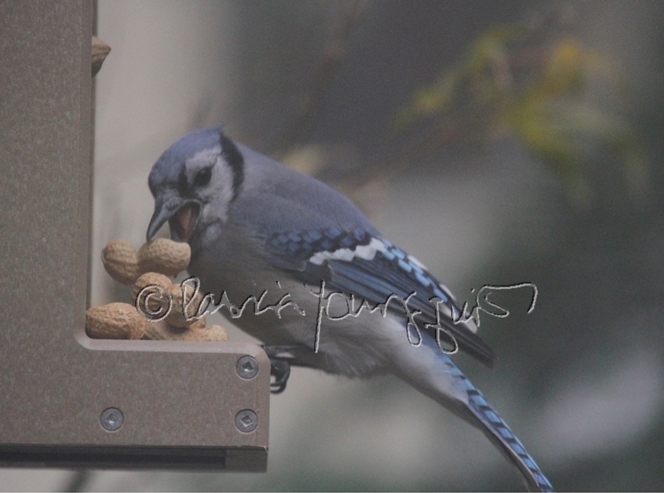 And blue jays eat suet, as you can see in the photos directly below. However (according to WBU-MICH), "if you offered a buffet, their first choice would be peanuts in the shell." 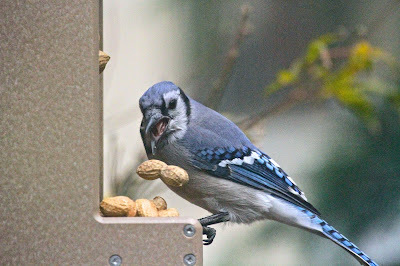 I certainly agree with them on this, for I have offered un-shellled peanuts in a variety of ways, and my efforts have not been lost on this bird type! 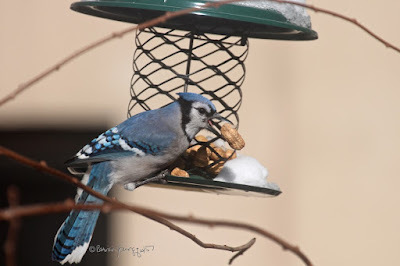 One of the first un-shelled peanut feeders that I got for my visiting bird was a "canister" style one, which can be seen in the following pictures featuring a blue jay enjoying the accommodations on a sunny winter day. 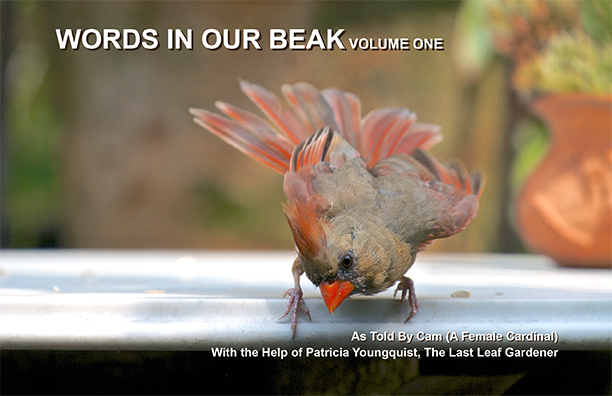 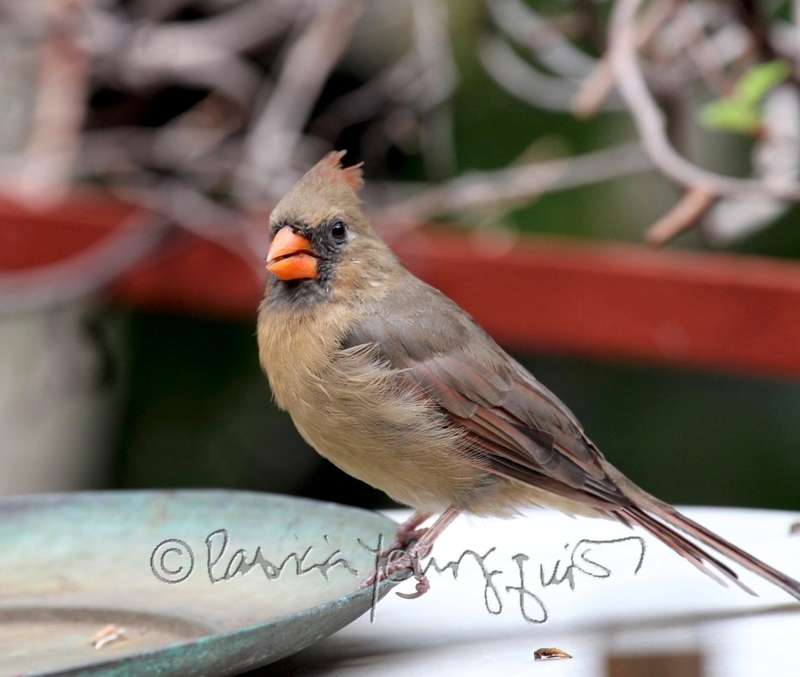 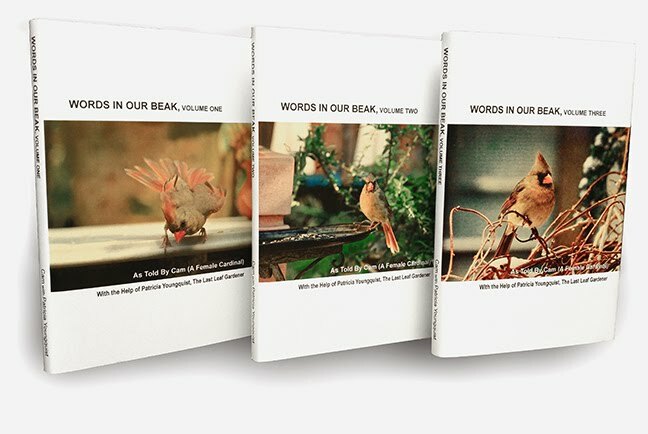 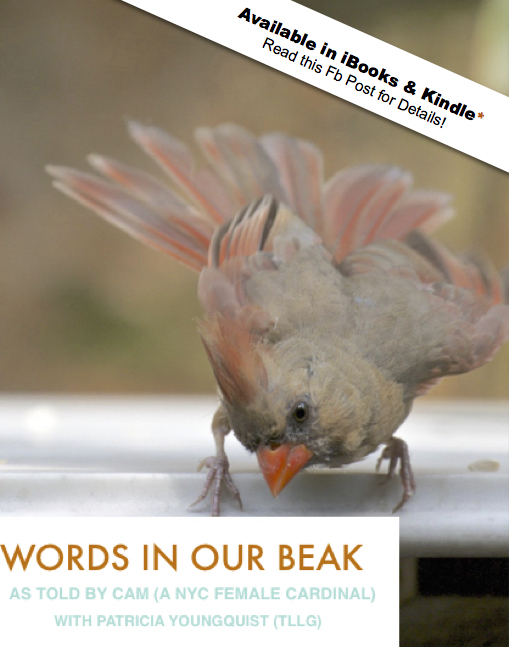 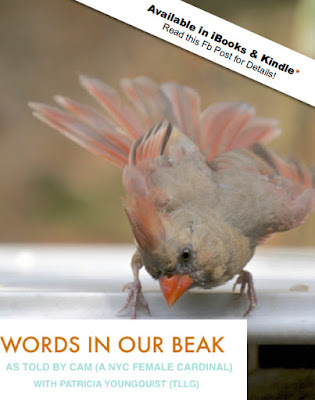 of the book, Words In Our Beak Volume One, which as you may know, is written from the perspective of a female cardinal. In any event, I gave my "canister" style feeder to a convalescing relative, who enjoys watching birds at feeders from her window. 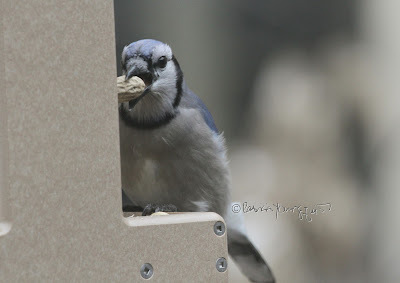 I replaced this with a "house style" unshelled peanut feeder which the blue jays also enjoyed, in all seasons, you can see in the next set of images. 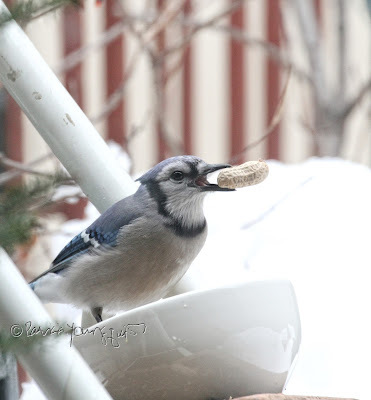 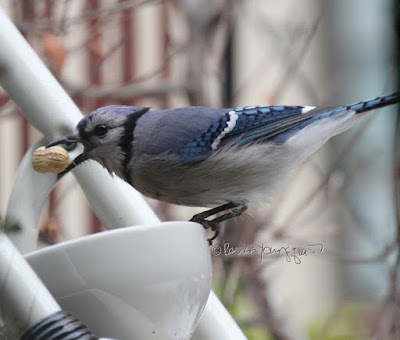 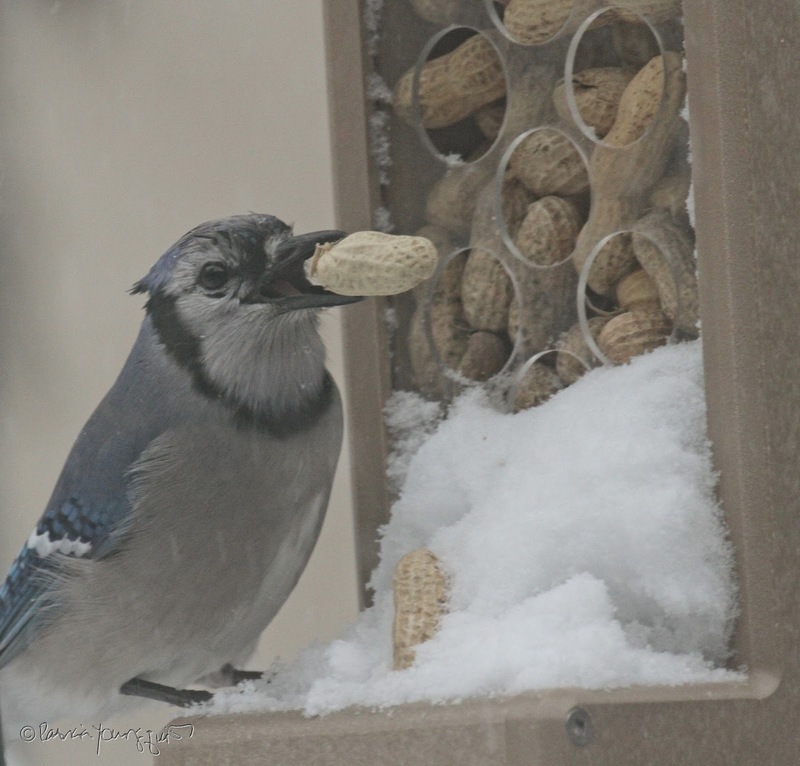 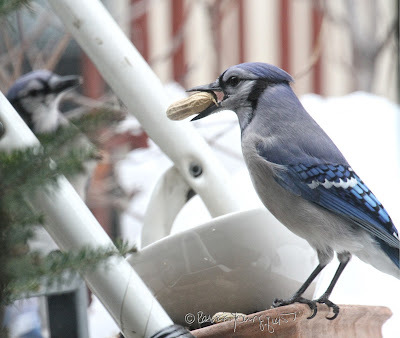 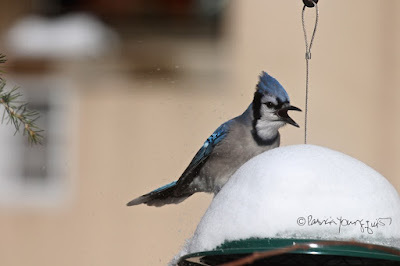 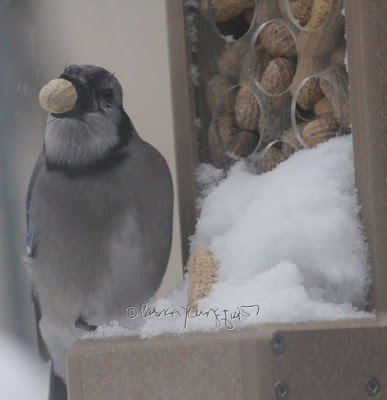 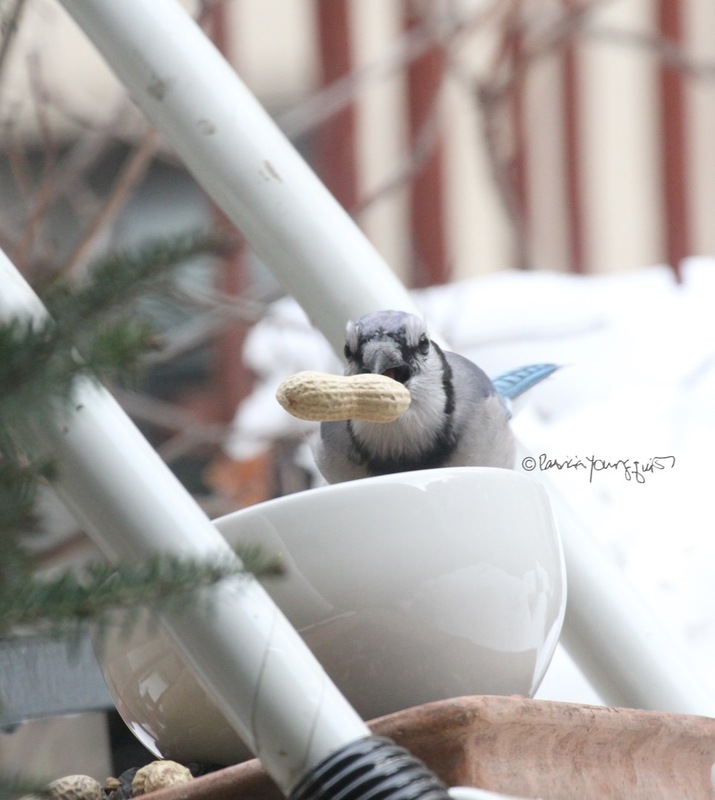 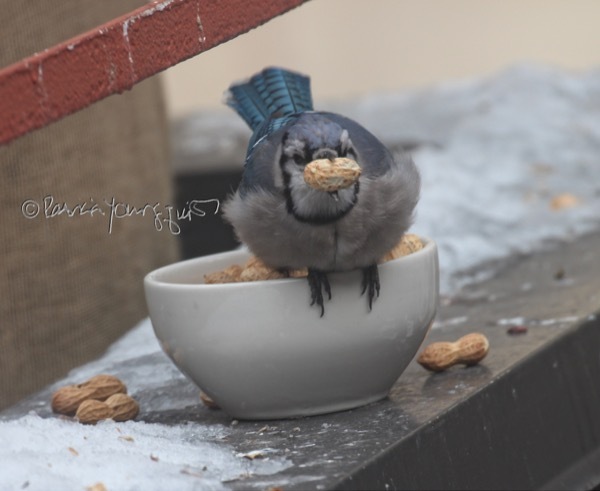 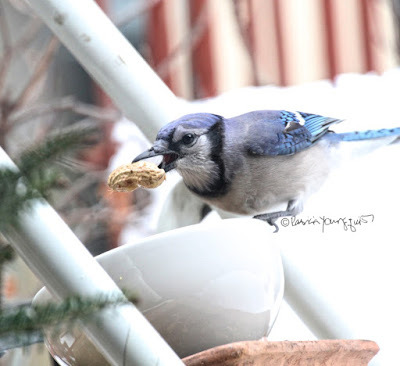 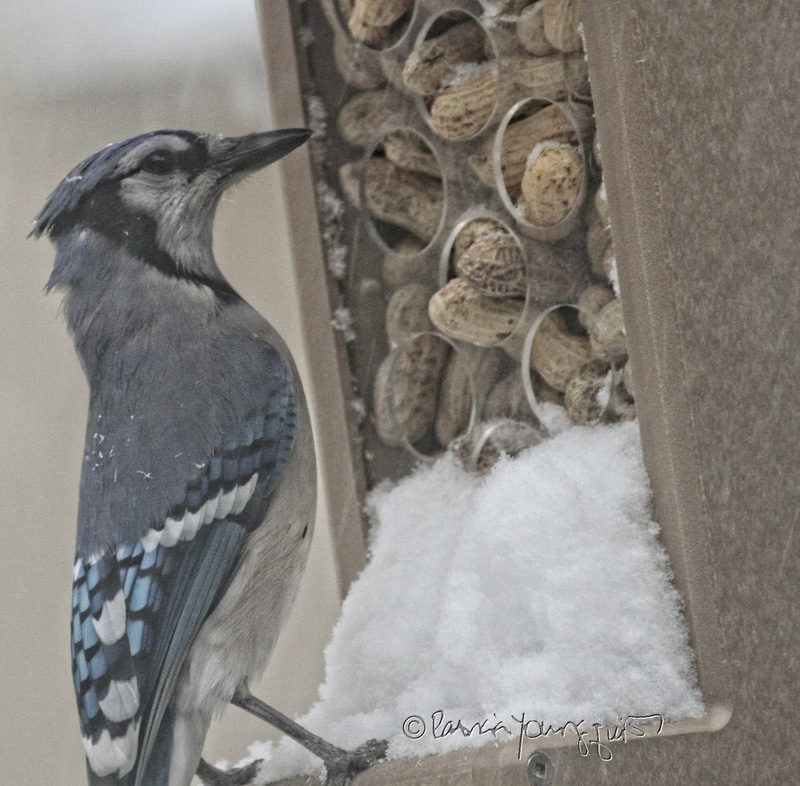 But even though the blue jays were able to eat from both the "canister-style" and "house-style feeder" when it snowed, if the snow fall was heavy, and I could not get to the feeders to replenish them, I put unshelled peanuts in a bowl in a place I could get to easily. 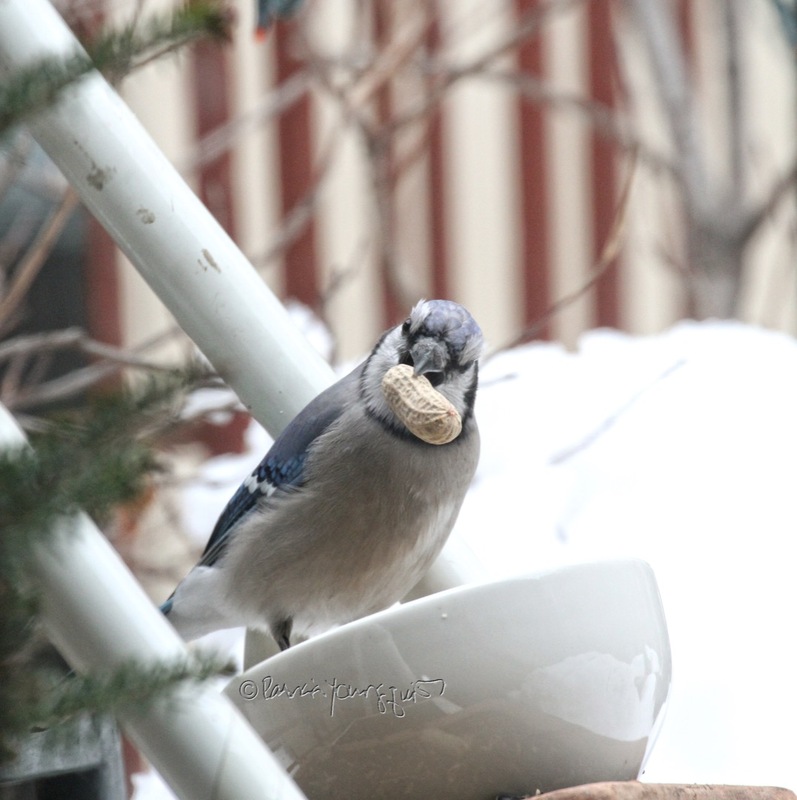 It seemed the blue jays appreciated my efforts (or at least they still appreciated my un-shelled peanuts), as evidenced in the next set of pictures. 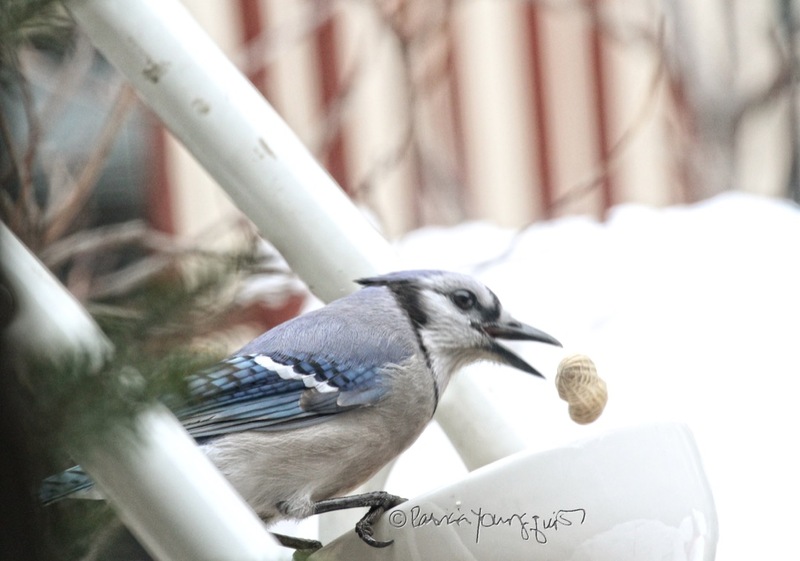 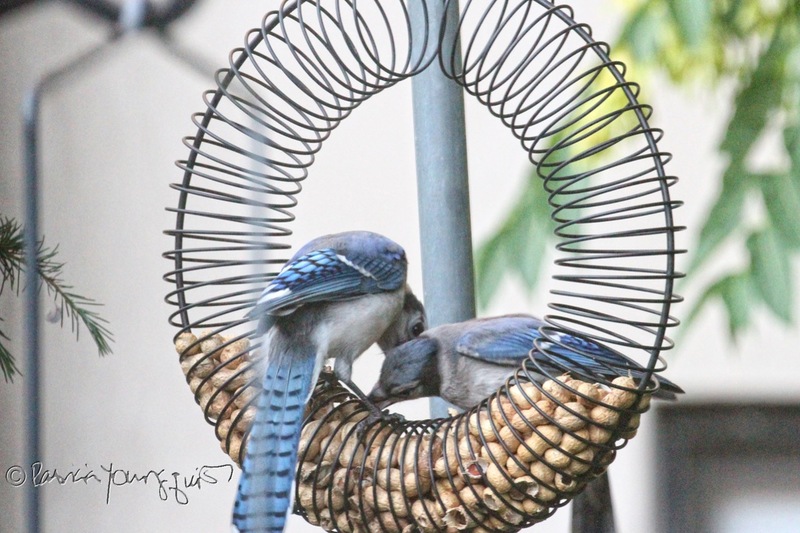 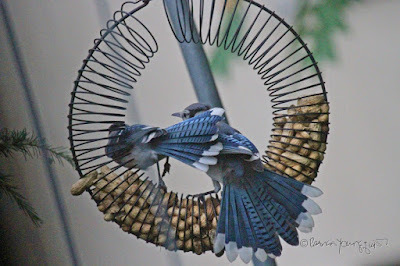 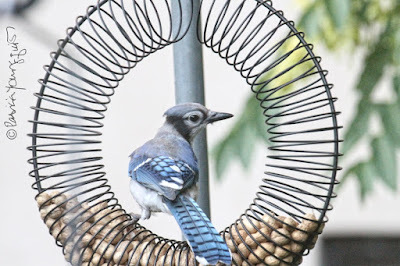 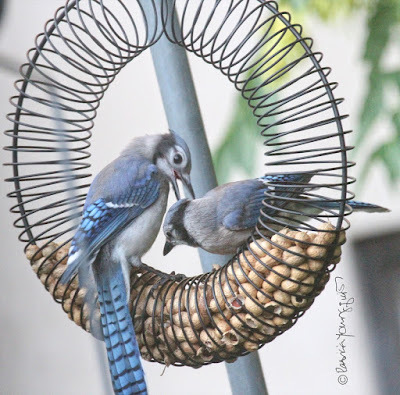 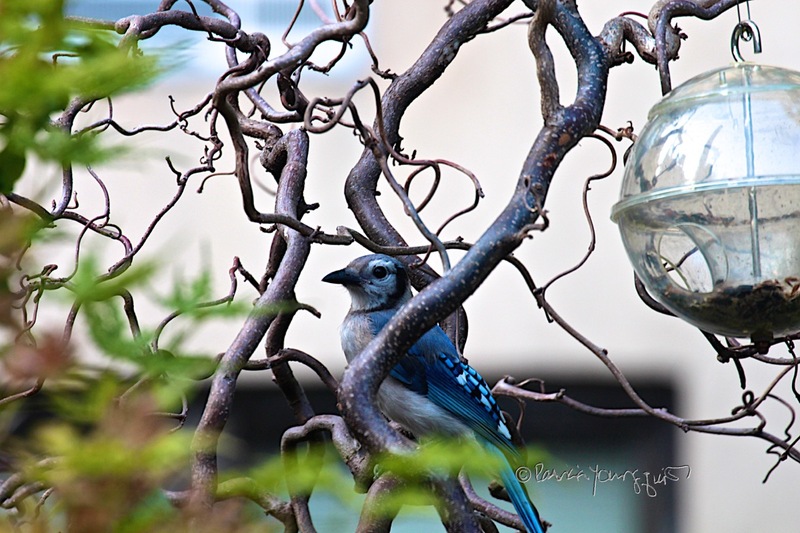 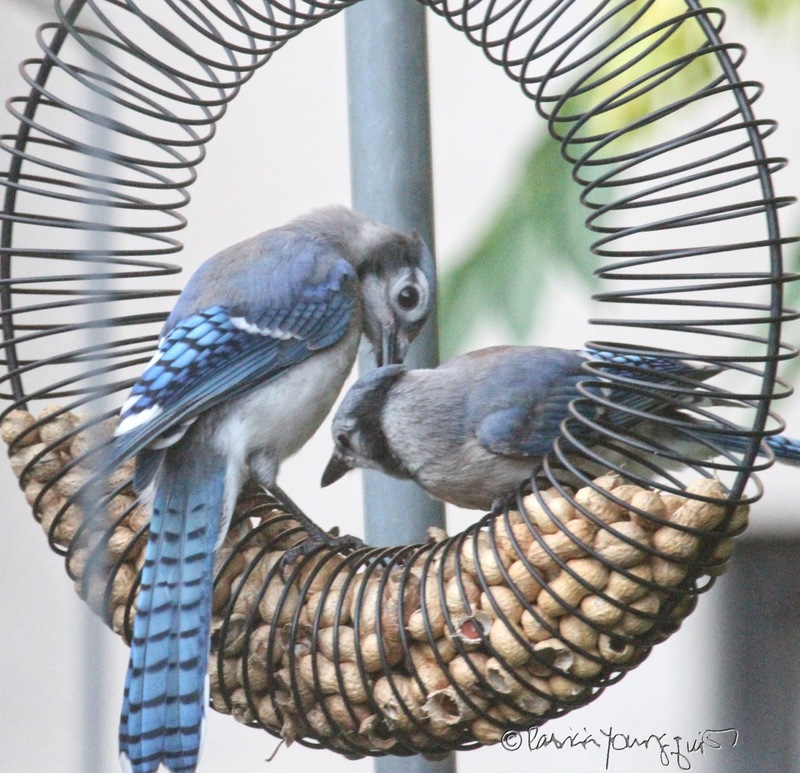 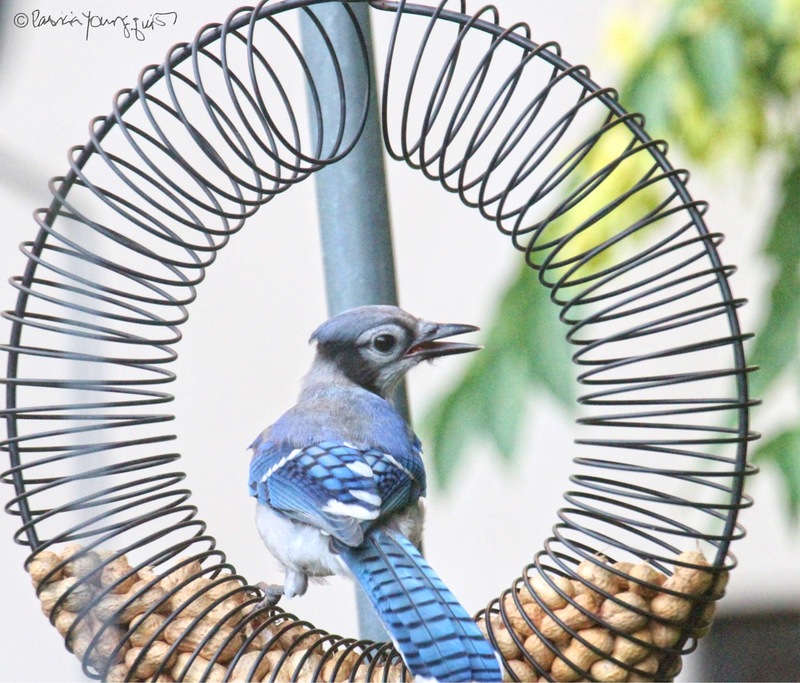 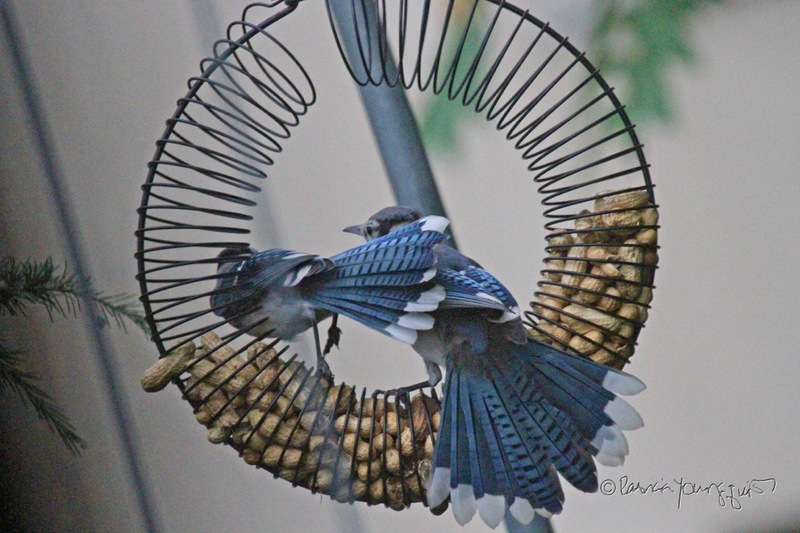 Currently, I have a wreath-style whole peanut feeder in my garden, it can be seen in the images below which feature blue jays taking pleasure in it. I've published a number of entries re my wreath-style whole peanut bird feeder number of times here on Blogger, where I've included images of other bird types (cardinals, common grackles, and, pigeons) enjoying themselves at this feeder. 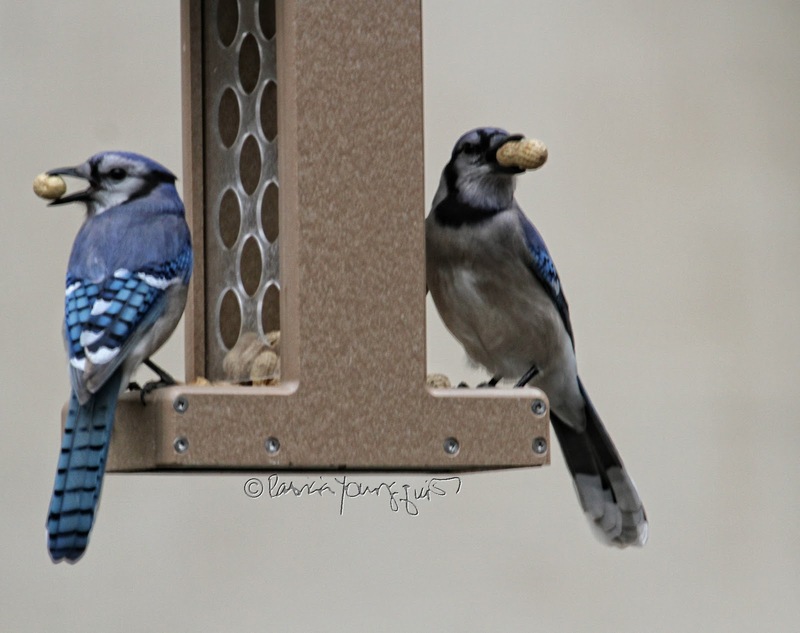 So, while Marie Antoinette may have said, "Let them eat cake;" and Tina Fey has recently said, "Let me eat cake;" WBU-MICH and I say, when it comes to blue jays, Let them eat unshelled peanuts.